It was actually kind of fun making the MLS roster maps, so I figured I'd continue with my merry map making. 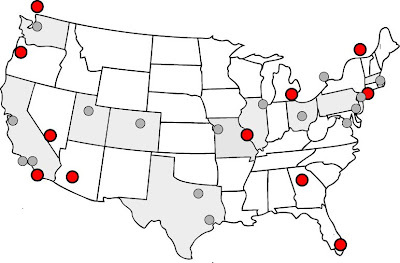 Although it looks kind of like a CDC disease outbreak map, it's actually a map of the most talked about potential MLS expansion cities and their proximity to current (and soon to be current) MLS teams. Here are a few facts about the various expansion candidates. I realise Detroit hasn't really been in the mix, but with their history as a solid sports town with a large metro population and their driving proximity to Chicago, Toronto, and Columbus, I believe that, at least hypothetically, they should be a solid contender. In the end it all comes down to who has the money and the support though. I seems that St Louis is very close to being next in line, which I believe is a good choice with the soccer traditions in that area and their proximity to Chicago and KC. Who do you think should be next in line? How many teams should the league expand to? Just found this through Facebook. Why Phoenix doesn't have a team or is never mentioned is bewildering. With its proximity to Mexico and a thriving sports community, MLS would be well supported there. I think a 20 team league would eventually be a good goal for MLS. I think they would be good to put a team in Vegas and Portland to help balance it out west, rather than put a bunch of teams in California. I think the biggest hurdle for Phoenix and Las Vegas (besides securing stadium sites and investors) is the summer weather. Both of those locations would likely have to use an indoor stadium that would cost more than an average SSS. Now that Seattle has a team, I think MLS needs to seriously consider Vancouver and/or Portland to round out the west coast. I think Miami should have a team. There are no other teams on the south east. With Miamis huge Latin population, i think a soccer team would be huge. The team owners have connections to FC Barcelona, which personally, would make me a fan right of the bat.